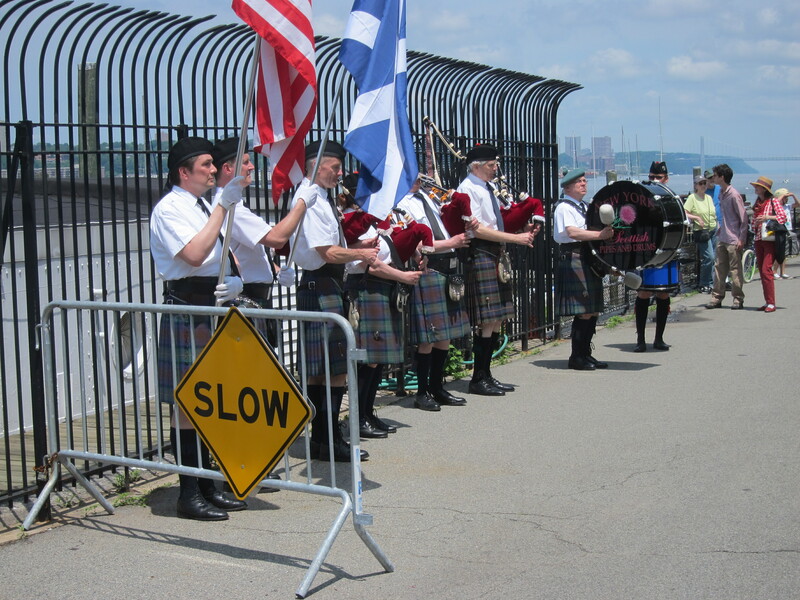 Memorial Day, 2011–I’ve been going about it all wrong, this riding in the city business. Rushing, competing with pedestrians, with cars, with other cyclists. Trying to make the light, running the light, cursing the oblivious and the reckless. You know, the city can do that to you. Make you harder, more persecutorial (which may be a made up word), more intent on destruction than you really are. What if, rather than compete, I were to seek harmony in my jaunts around town? stopping even for those complete morons crossing against the light, faces buried in cell phones, and not judging their stupidity or getting angry about it. So today I was doing that and really enjoying my ride. I was leisurely cruising finding the spaces surrounded by air, letting the traffic flow around me, a pebble in the mechanical stream. I rode busy city streets – 5th Ave., 59th St., Second Ave., 21st St – engulfed in calm. I came to the Hudson Greenway along the West Side Highway at Chelsea Piers to take in the sights and headed north. I knew it was Fleet Enema Week and that there would be crowds, huge crowds and that I’d have to dismount for a couple of blocks starting at the Intrepid. Rather than loathe this interruption, I looked forward to it. Looked forward to the crush of tourists, enlisted personnel, joggers, amblers, and wide walkers. A Navy swing band played and people clapped and everyone acknowledged that, hey, sure it’s humid and crowded, but dammit, we’re civilized and having a good time anyway. After just two or three blocks on foot, I resumed my ride, enjoying the breeze, the pure joy of moving. 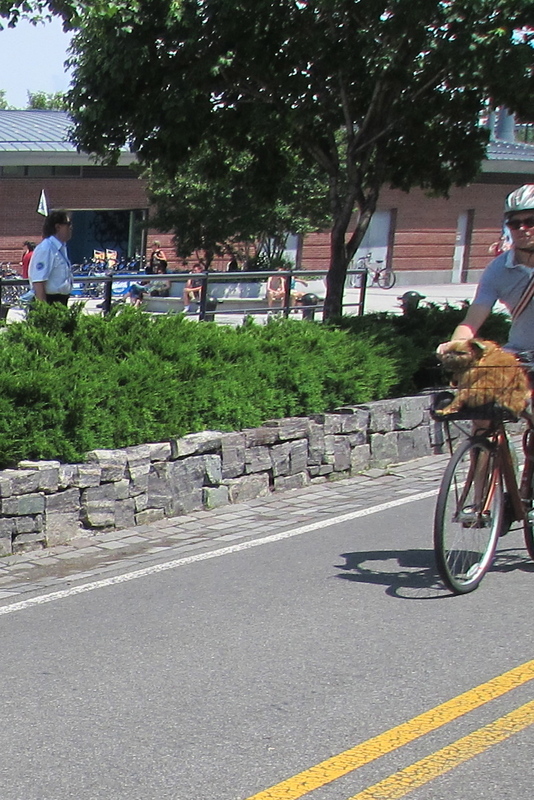 And then this fellow approached with a dog in his basket. I saw them from a distance, with more than enough time to get the shot. I pulled the camera from my pocket and snapped a shot. But there was glare and when I reviewed it, I saw that I had just barely gotten the dog in frame. I couldn’t just let this go… what if the picture was blurry when I blew it up at home? 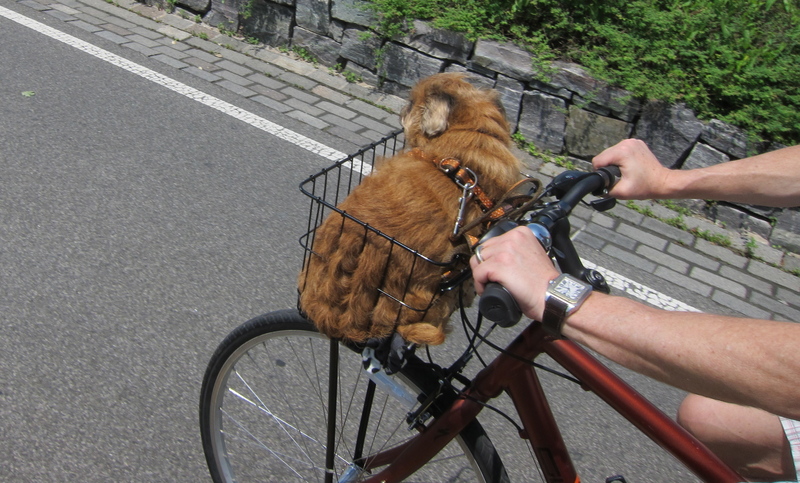 Do you know how rare a dog in the basket of a male rider is? Sure, you’ll see men running with dogs, occasionally even pulling a dog in a trailer hitched to the seatpost. But never in a basket. Never. Ignoring oncoming bikes and joggers, and a particularly uppity skater, I u-turned and sped off after the rider. But the lights had changed and buses were entering and exiting the parking lot and I had to stop. I watched a bus go, but the next on hesitated and I jumped through the light. Victory! Next light, red again, and a cop waving cars through. Defeat! A few seconds later, the light changed and off I went. The guy was nowhere in sight and I rode like the old me, weaving, dashing, accelerating around wide walkers with their ridiculous triple-decker strollers, cutting off all those people who had no business being there: everyone! Whoa! Is he used to in riding bikes? Lucky, he is not moving while in it.